One primary school pupil's daily dose of school dinners. Just wanted to let you all know we've been given the chance to tell our behind the blog story for the first time. Martha and I have written this together to share the highs and lows that will take us to Malawi next month. Most importantly every sale will feed 25 children in Malawi for a day with Mary's Meals. Out Nov 15th. Pre Order here and share the experience with us. I have just pre-ordered my copy. It is currently the 300,462th most popular book on Amazon UK. That is one number that will be shrinking fast between now and Christmas I think! Is this going to be available in the USA? You can also order from amazon.co.uk with the same amazon account and they deliver in the US or any other country. Ordered ... :) I can't wait for it to arrive. That's one book sold, Veg. I look forward to a terrific read of all the behind the scenes drama. It is remarkable how your small blog has grown and changed. It has become much more than posts about school lunches and nutrition. I cherish the many things I have learned about food and cultures - and the people I have met - around the globe. Even though some of us, in our enthusiasm, have misspoken or miswrote a comment, we have corrected, overlooked, regrouped, forgiven and moved on. It continues to be one of my highlights of every day - it is just as wonderful as when the sun comes up or the full moon shines. With all the followers you have on All the continents of Earth I wouldn't be surprised if there was a penquin and a polar bear in front of their computer somewhere curled up in the snowy climes savouring thoughts about the delicious meals on offer. May you and your family always have good health, long life and happiness. Good luck in Malawi. We are all waiting with baited breath to live your adventure vicariously. Fantastic! I've just added to my wish list. Come on U.S. Amazon, we want this book, too! I can't wait to read it, Martha. You are a true inspiration! Have you set up an Amazon Associate account? It gives an additional commission on each sale but more important, I think a commission on any other books (or other items) ordered after clicking on the link. Not sure if it can be taken as cash but if not then you could always buy books to be sent out to the school in Malawi. JMB, I don't want to sound like I'm picking on you. Truly I'm not. But I think the Payne family probably already has enough on their plate. They still have their small-holding, and I'm not sure how Dave manages to keep up with that between helping Veg with her blog, clearing all comments on the blog, dealing with all of the media requests (and there are a lot), shielding Veg from unwanted publicity (Veg once blogged about having to get picked up from school because of photographers laying in wait for her), getting the family ready to take this trip, and now writing a book with Veg. And Veg's mother is a general practice physician with a practice to attend to. In addition, the two of them have three children that require their attention. Veg is 9 years old, so she can't drive. Which means that when she's invited to do things like going to Nick Nairn's symposium, her parents have to take time out to drive her there and wait until it's finished to drive her home. In addition to being involved in the meals program at Mary's Meals, Veg has previously blogged about participating in the backpack program for Mary's Meals, as well. Again, given her age, this requires parental time to do. 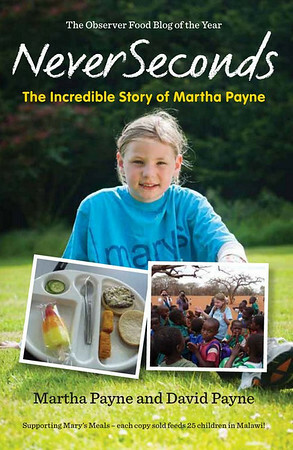 The Payne family is so committed to Mary's Meals that they have been very careful to make sure that any money they receive as a result of Veg's fame goes to the charity and -- because of that -- they have personally paid all of their expenses for their family trip to Malawi. As a result, I can well imagine that Dave probably simply doesn't have time to become an Amazon Associate. I suspect that he's helping Veg write the book but leaving the sales details up to the publisher. And it's the publisher that has put it up available for sale on Amazon. Plus the fact that I kinda doubt he has the time to buy books for the school in Malawi. I know your suggestion was given with only the very best of intentions, but -- as I said -- I rather suspect that the Payne family is already feeling overwhelmed by all of this. I'm waiting until it's available in the US. Great job David & Martha, you guys rock! You can log onto Amazon.com.uk with your normal Amazon.com information. They will ship your copy to you. Although the price (and postage) are listed in British Pounds, your credit card will be charged at the current exchange rate. £6.99 is approximately equivalent to $11.30. Postage is £6.98. So the order total will be £13.97, which is about $22.60. If that seems a lot to pay for a small book, remember that every sale feeds 25 children in Malawi for a day with Mary's Meals. So you're not just paying for the book. How long can you feed a child for $22.60 here? And on a related note, folks in the US can donate to Veg's Mary's Meals site the same way. Again, your credit card company will perform the currency exchange for you. Perhaps someone should approach Amazon US and suggest they get some copies in stock in the US. More copies might be sold if the price was not doubled by postage. More copies sold means more to Mary's Meals. JMB, often that is not a decision Amazon.com is able to make. I have a friend (who also happens to be from Scotland), who writes fantasy-genre books. She wrote a great trilogy but her publisher decided not to release it in the US because they didn't feel it would "translate" well to American readers. (Which most of her American readers thought was nonsense, but....) So the only way you could get a copy was to order it from Amazon.co.uk or, if you knew the author personally, she had some extra copies the publisher had given her that she would mail to you. I totally agree that, given Veg's world-wide readership of her blog, it would be nice if the book was available internationally. But that may be a decision made by Cargo Publishing, and not Amazon, or the Payne family. It's also possible that Cargo Publishing is waiting to see how well the book sells in the UK (once it's actually published) before making the decision to release it more widely. Thanks for the link Jaylah! It was so nice to read about her trip. Well done, just about to pre-order mine. Great blogs over the last few weeks. Have a great time in Malawi, and we are all thinking of you!! Thanks Jaylah!I was just going to ask how to buy it in the US, but you answered my question. Well Done Martha and Dad, can't wait to read it! THIS IS AWSOME WELL DONE!!!!!!!!!!!!!!!!!!!!!!!!!!!!!!!!!!!!!!!!!!!!!!!!!!!!!!!!!!!!!!!!!!!!!!!!!!!!!!!!!!!!!!!!!!!!!!!!!!!!!!!!!!!!!!!!!!!!!!!!!!!!!!!!!!!!!!!!!!!!!!!!!!!!!!!!!!!!!!!!!!!!!!!!!!!!!!!!!!!!!!!!!!!!!!!!!!!!!!!!!!!!!!!!!!!!!!!!!!!!!!!!!!!!!!!!!!!!!!!!!!!!!!!!!!!!!!!!!!!!!!!!!!!!!!!!!!!!!!!!!!!!!!!!!!!!!!!!!!!!!!!!!!!!!!!!!!!!!!!!!!!!!!!!!!!!!!!!!!!!!!!!!!!!!!!!!!!!!!!!!!!!!!!!!!!!!!!!!!!!!!!!!!!!!!!!!!!!!!!!!!!!!!!!!! I have chicken tikka panini or bacon baguette!!!!!!!!!!!!!!!!!!!!!!!!!!!!!! well done this is the best blog ever you are really epic for doing this. Enjoy your trip to Malawi. Saw you on BBC news this morning. Hope you enjoy your time in Malawi - cannot wait to read how it went! hi veg me and all my friends are behind you just to let you know and i cant belive your 9 years old !!!! So excited for you both! Congrats! Yay! Now Amazon Bestsellers Rank: 2,061 in Books. That's good work there. Yay! Now Amazon Bestsellers Rank: 2,061 in Books. Astounding! My name is Sam Edwards and, I am the CEO to the campaign 'One voice for the kids'. I was watching 'Newsround' with my youngest child a few days ago and happened to catch your amazing story and efforts in bringing the much needed awareness in to the school dinner saga. As a children's advocate and human rights campaigner, this really hit home for me. Your visit to Malawi is something that I am currently involved with myself. I am helping to raise awareness and raising enough funds to be able to go over to Kampala, Ughanda some time next year to help an orphanage that is under constant threat of children being abused and sometimes killed. I am currently making a video to publish on youtube and hopefully mainstream media TV about the constant struggle we as a race are facing and fighting every single day to survive. I am inspired by your story and would therefore like to ask you for permission to use your story in my video in the hope that it will do to others what it did to me. I would like to illustrate to people that if a 9 year old girl can get the attention of the world over school dinners and starving children, then it proves that people do indeed listen. In this case, the only real difference is that a child has told the world that children are dying unnecessarily due to food shortages, no clean water and lack of funds. Martha, may I just again congratulate you on a fantastic effort in combatting this global problem and I hope that you continue this for many years. The world needs more people like you in it. You and all children in the world, are the future and we back you all the way. Just saw you on the one show, you are truly inspiring and have humbled us both. We will make a donation on pay day. You have touched our hearts. If only 1 in 1000 kids had your determination, commitment and drive the world would be a much better place. Well Done. Your Parents must be so proud of you, you deserve all the good that will come your way. 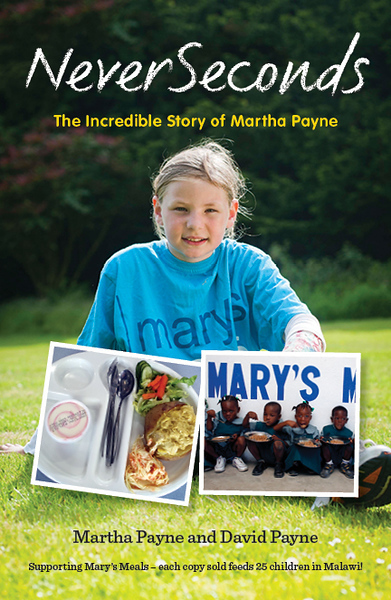 Click Photo to order our book supporting Mary's Meals. My dad says I should call myself Veritas Ex Gustu, truth from tasting in Latin but who knows Latin? You can call me Veg. Ethereal theme. Theme images by hatman12. Powered by Blogger.